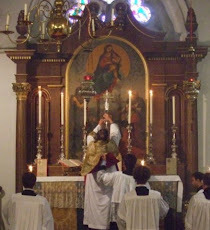 ... has written a very good piece on Initiation (Hermeneutic of Continuity blog) pointing out that all the modern stuff about witholding sacraments until endless catechesis has been done is rather like the puritanical Jansenism of the 18th century. It is a must-read. Somebody one day will have to write a history of the contribution of the blogosphere to investigating the Tradition and recovering its wholeness and bringing new - yet traditional - awarenesses to the attention of the modern Church.